The leaders of the Czech Republic, Hungary, Poland and Slovakia gathered around a cake this week in Prague, celebrating the 25th anniversary of the Visegrad Group, an organization that has been largely forgotten since its creation in 1991 following the collapse of communism. The mini-bloc is finding a new purpose as frustration grows among governments in the region over what they see as the European Union's chaotic and ineffective response to the growing migrant crisis. "The migration policy that we have seen so far has failed, and this only created terrorism, violence and fear," said Hungary's prime minister, Viktor Orban, whose policies of not welcoming the migrants have received criticism in Western Europe. "Our position tends to be that the migration flow must be under control and must be stopped," he told reporters at the end of a Visegrad gathering Monday in Prague. For some in the V-4 grouping, the enemies in the newest divide between East and West are Greece and German Chancellor Angela Merkel. Orban proposes a solution that is directly opposed to the policy promoted by Merkel, who wants all EU members to absorb an equal number of migrants. 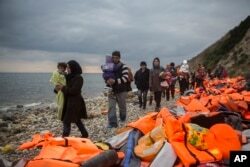 Officials project 4 million migrants and refugees will seek asylum in Europe this year. FILE - Migrants wait on a bridge for their registration and transport by German police to a refugee shelter, Sept. 24, 2015 in Salzburg, Austria at the border to Germany. Instead, the Hungarian leader wants a fence built on Bulgaria and Macedonia's border with Greece, effectively cutting off Greece from the 26-nation Schengen Area, of which it is a part. Athens has failed to prevent hundreds of thousands of migrants, largely from Syria and Iraq, from crossing its territory and therefore, Orban and others argue, has not met its obligations to protect Europe's borders. The proposal has rattled EU officials, who are campaigning to keep the European Union from breaking apart. "The migratory crisis we are currently witnessing is testing our union to its limits," European Council President Donald Tusk said Tuesday in Prague. The EU chief was completing a five-nation tour to build consensus before a summit Thursday on Britain's bid to renegotiate the terms of its EU membership, another deeply contentious issue that could bring the departure of the bloc's second-richest economy. In Athens, also on Tuesday, Tusk found himself offering reassurances to Greek leaders shaken by the prospect of being cut off from Europe. "Greece did not cause this crisis, nor did Europe,” Tusk said at a joint news conference with Greek Prime Minister Alexis Tsipras. “To all those talking of excluding Greece from Schengen, thinking this is a solution to the migration crisis, I say no, it is not. Let me be clear: Excluding Greece from Schengen solves none of our problems." FILE - Macedonian policemen guard the borders of their country as an army truck arrives to build a border fence to prevent illegal crossings by migrants, in the Greek-Macedonian border near the Greek village of Idomeni, Nov. 28, 2015. Until now, Visegrad countries had been in line with the rest of Europe in terms of economic development and open borders. The migrant crisis, however, has changed things. In the eyes of some, calls by Merkel and others for all EU nations to accept migrants recall an ugly chapter in history, when Nazi Germany dictated an extremist ideology to its eastern neighbors. There are concerns the calls are fueling nationalist sentiments and giving rise to right-wing political movements in central Europe and beyond. "This is not only Orban who is speaking about building fences in Europe,” Dariusz Kalan, a political analyst at the Polish Institute of International Affairs, a Warsaw research organization, told VOA. “These voices are significant and visible, not only in Hungary but also in the Balkans and also in Austria, not to mention radicals in Germany or France." Aside from its unanimous rejection of any attempt to impose migrant quotas, the V-4 grouping is far from united in its approach to the migrant crisis. Czech Prime Minister Bohuslav Sobotka is seen as the most liberal and ready to compromise. Slovakia's Robert Fico, a hard-liner, is under pressure to appear even tougher as his country heads toward elections. Poland has traditionally had strong ties with Western Europe, but elected a right-wing government late last year. "What is happening at the moment is an attempt to find a compromise within the V-4 countries which would somehow enable them to speak with a single voice on the European level, but at the same time would not undermine their position completely as a part of Europe," Tomas Jungwirth, an analyst at the Association for International Affairs, a Prague research institution, told VOA. V-4 leaders are walking a delicate line, and their summit declaration in Prague this week was conciliatory. They pledged not to block any EU solution to the crisis and work against "emerging new dividing lines" in Europe. "Let me stress very clearly that the declaration adopted today includes a clear call of support from the V-4 for a European solution to the crisis," said Beata Szydlo, Poland's new prime minister, at the close of the V-4 summit Monday. The Visegrad countries' challenge now is to preserve their membership in Europe with all its economic benefits, while answering to a constituency frustrated with the rest of Europe's response to the migrant crisis. Meanwhile, Merkel is going ahead with her push for Europe to absorb more refugees. In view of the Visegrad countries' opposition to her proposal, the German leader is working on a plan to receive more refugees who transit through Turkey. Merkel last week said "a group of countries" may be willing to accept a larger number of refugees if Turkey does more to boost its efforts to stop migrants from illegally transiting its territory.